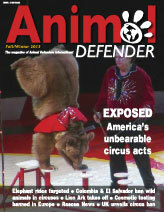 Welcome to the US version of Animal Defender Magazine, Winter 2013-2014. All articles can be read online by clicking on the links below. Alternatively, click link at the bottom of this page to download the entire magazine as a PDF. If you want the vital work we report on here to continue then we urgently need your support – please donate today. Read our special winter appeal here. In October, we unveiled a new tool to create awareness about animals: the feature-length documentary Lion Ark. Following ADI’s intense media and public campaign, Oregon Zoo confirmed that baby elephant Lily would not be handed over to disgraced performing animal suppliers Have Trunk Will Travel. Despite enormous public opposition, the Nevada County Fair Board proceeded with plans to offer elephant rides, facing protests each day outside the fair. In March 2013, ADI launched a new video, No Fun for Elephants, narrated by Emmy award-winning TV host Bob Barker. On March 11 2013, history was made when the sale of cosmetics products tested on animals was prohibited across the European Union (EU). In January, the Iranian Space Agency reportedly sent a monkey into space. In April, a Russian space mission launched with 45 mice, 8 gerbils, 15 geckos, cichlid fish and snails on board. While Los Angeles City Council contemplated ever weaker measures for circus animals, West Hollywood adopted a strong measure. The City Manager of Lake Elsinore, California, denied a permit request from The Great Bull Run, preventing the cruel event from taking place in Lake Elsinore. To mark International Primate Day, September 1, ADI revealed primate suffering and exploitation at Schwaben Park in Germany. Iconic British fashion model Twiggy joined ADI in highlighting fur cruelty during London Fashion Week. A big congratulations to all of our determined campaigners and partners across Central and Latin America! Timeline of events leading up to the Colombia circus ban. Peru banned the use of wild animals in circuses over two years ago, now the Peruvian Government wants to work with ADI on enforcement – just as we did in Bolivia. Please help. Join the campaign that is changing the world for performing animals. The latest news about ADI’s global Stop Circus Suffering campaign. Pat Derby, co-founder with Ed Stewart of the wonderful PAWS and the ARK2000 sanctuary in California, passed away peacefully on February 15 after a two year battle with cancer.